Preheat the grill to medium – about 350 degrees F. Brush the grill grates with extra virgin olive oil to prevent sticking (optional). Combine paprika, coconut sugar, sea salt, black pepper, ground mustard, garlic powder, oregano, onion powder, and cinnamon in a bowl and stir until completely combined. Pat the drumsticks dry with paper towels. Toss the drumsticks with the spice rub until completely coated. 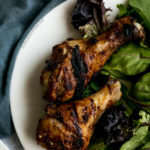 Grill the drumsticks for 10 minutes, then flip and grill for an additional 10 minutes. Maintain the temp at around 350 degrees F, and avoid opening the grill unless you’re flipping the drumsticks—which you should only do once! If there are flare-ups from the chicken juices, reduce the temp slightly.